Women with breast cancer can find many forms of support, much of it from organized groups. Men with breast cancer, on the other hand, might not know where to turn. After all, only one per cent of breast cancer patients are men, and the disease is almost universally perceived to be a "woman’s cancer." On social media Bret and Peggy found Cheri Ambrose, who started the Blue Wave, a New Jersey men’s breast cancer awareness organization in 2009. 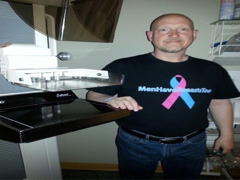 In 2013 the Male Breast Cancer Coalition (MBCC) formed to support men with breast cancer and to promote awareness. The MBCC website provides a place for men with breast cancer from all ethnic backgrounds and ages to tell their stories. 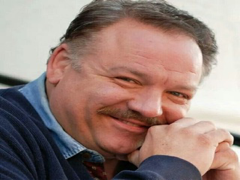 An In Memoriam page reminds people of the sad fact that male breast cancer is so deadly mainly because it so often diagnosed at a later stage than breast cancer in women. Eric Henderson, diagnosed in 2016, points out how the group put him in touch with others who could answer specific questions. 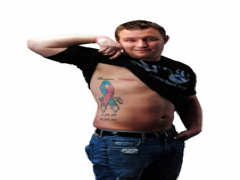 Because male breast cancer is rare, getting the appropriate treatment may be challenging. Eric went to experts for a second opinion. For a man who is already feeling isolated or "unusual" because of his diagnosis, entering the women’s breast cancer world can seem overwhelming. Treatment for male breast cancer is similar in most ways to that for women. Mastectomies are usually part of treatment. Because most cases are hormone receptor positive, men often receive hormonal treatments. Depending on the stage of the cancer, they may also receive chemotherapy and/or radiation. And, just as with women’s breast cancer, some men’s cancers spread. 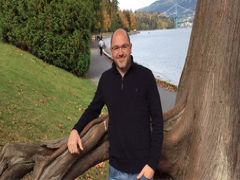 Kirby Lewis has found the MBCC to be a great support to him as he lives with metastatic breast cancer. “Metastatic breast cancer is not a life sentence," he said, " it is not a death sentence, it is an opportunity, it is an opportunity to live. Love living life, make it precious, because it is, make it special, because you are. Just live!” Although treatments often leave him tired, he is finding joy in life through his faith and through marketing TroggBall, a toy he designed. 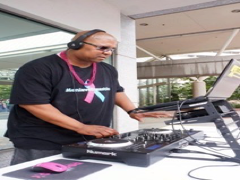 He is using the game to educate people about male breast cancer.